The Falls and the Shankhill united, Catholics and Protestants fighting together. That is the story of the Outdoor Relief Strike launched by the unemployed of Belfast in 1932. It is important today not only because it is a part of our history that has been denied space in the school books but also because it was a living demonstration that the sectarian barrier can be breached. The Wall Street crash had hit the industrialised countries hard. Northern Ireland was hit harder than most. Its two principal industries, textiles and shipbuilding, took a hammering. Because the crisis was world wide the Stormont government could not continue to export the unemployed. Up to 1931 10,000 a year had been sailing abroad in search of work. Now there were no jobs anywhere and both Canada and the USA started to give 'one-way' tickets home to recent immigrants who had not become citizens. The Poor Laws had been scrapped in the South in 1924 and in Britain in 1928 but Stormont kept them in operation. This gave the jobless a very raw deal and their numbers were rapidly growing. Out of one and a quarter million people over a hundred thousand had seen their jobs disappear. Of these 42,710 were getting benefit, 19,380 were on transitional benefit (which was reviewed every three months) and 13,908 got no money at all. A further 24,000, mainly women and young workers, were not even officially registered. And several thousand others had their benefit reduced or stopped by the operation of the 'means test'. As the 'means test' increased the number of unemployed not getting any money from the Labour Exchange, there was an increase in the number applying to the Board of Guardians for 'outdoor relief'. These schemes employed married men at tasks like road repairs for a wage of between eight and twenty four shillings (40p-£1.20) depending on the number of children the man had. To get onto this scheme a man had to submit to a rigorous investigation of his circumstances. Such task work generally lasted six months with one to three days work a week. At the time of the strike about 2,000 were employed on ODR. Everywhere the unemployed were organising. In the South the Irish Unemployed Workers Movement was holding large demonstrations, at one meeting in Longford in October 1,000 turned up to hear speakers from the Movement (including Jim Gralton the only Irishman ever to be deported by a Dublin government). In Britain the Hunger Marches were taking place alongside disruptions of political banquets and invasions of factories to appeal for an end to overtime and speed-ups. Against this background the Revolutionary Workers Groups had become active. While the RWG's went on to form the Communist Party of Ireland it must be remembered that Stalin's crimes were not widely known then and that it was the only socialist organisation of note that was active. They set about arguing for a fighting response to the dole queue and won a certain respect from the unemployed. An Outdoor Relief Workers Committee was set up and shortly after Tommy Geehan of the RWG, who was also a delegate to the Belfast Trades Council, called for a strike by the ODR workers. * Abolition of task work. * Increase in relief payments to: Man l5s 3d per week, wife 8s and 2s for each child. * No payment in "kind" - all payments to be in cash. * Street improvement work and other such schemes to be paid at trade union rates. * Adequate outdoor allowances for all single unemployed men and women who are not in receipt of unemployment benefit. Needless to say their demands were not conceded. On Monday October 3rd the strike began and was 100% solid. That evening a crowd of 30,000 marched from Frederick Street Labour Exchange to the Custom House steps where a mass meeting was held. This was the first time since 1919 that workers had ignored the bigots and united on class lines to fight for their own interests. Catholic and Protestant made common cause against the ruling class. The next morning 7,000 marched to the Lisburn Road workhouse where the Board of Guardians usually met. The road, one of the main routes into the city, was blocked for three hours. A delegation was received by the Guardians (after threats of what would happen if they refused) but nothing was got from them other than a letter to the government asking them to provide more relief. On Wednesday October 5th the RUC prevented another march to the workhouse by lining the route with Crossly tenders and Lancia armoured cars. Nevertheless demonstrators got past the police lines and 144 were admitted to the workhouse as inmates. Once inside they refused to obey orders and were reported singing and dancing throughout the night. Three were arrested and removed from the building. That night rioting broke out in several places. A tram was hijacked and dozens of shops were looted in the main Catholic and Protestant areas. The RUC baton charged the crowds as soon as they formed. The rioting continued for the rest of the week. The local ruling class and Unionist establishment suddenly realised the seriousness of what was happening. They had nothing against rioting, they had organised many anti-Catholic pogroms themselves. What was occurring on the streets was very different, it was the one thing they feared - working class unity. On Monday 10th the Lord Mayor, Sir Crawford McCullagh took representatives of the Guardians into his parlour in City Hall to try to come up with concessions that could kill the influence of the ODR Strike Committee. The night before McCullagh had been visited by leading businessmen who urged him to do something quickly. The offer put to the strikers was for more relief work plus extra pay for extra time worked. At a mass meeting in St Mary's Hall the strikers turned this down. They wanted full trade union rates of pay for all work done and an increased rate on the ODR schemes. A rent strike was called, bonfires lit in working class districts and speakers from the strike committee addressed thousands. The city became like an armed camp with thousands of police being called in. Tensions were running very high. A special mass meeting of women was also held in St Mary's Hall where they pledged to stand shoulder to shoulder with their men-folk in the coming fight. A huge demonstration was called for the following day (Tuesday 11th). The government banned it under the notorious Special Powers Act and put the Royal Enniskillen Fusiliers on stand by. The RUC were issued with rifles as well as their usual revolvers. Tommy Geehan had predicted at the women's meeting the previous night that no ban would stop the demonstration. "For many years the workers of Belfast have been divided by artificial barriers of religion and politics, but the past two months have witnessed a wonderful spectacle, because the workers were united on a common platform demanding the right to live. Tomorrow you will see the mightiest demonstration of unity there has ever been in Belfast. The authorities have banned the demonstration but the workers are going out". And they did. Fighting broke out when police tried to disperse the workers. Armoured cars were called in and the strikers went to the ODR sites to get their tools. These tools now became weapons. Fierce hand to hand battles took place on the Falls and the Shankill, with the RUC bringing their guns into play. Sammy Baxter, a Protestant from Regent Street who had been fighting alongside his Catholic fellow strikers, was shot dead on the Falls. The people responded by building barricades to keep the police out and repulse their attacks. That night a police curfew was enforced for the first time since 1922. Everywhere the police with their guns and armoured cars went they were met by stone throwers. Each time they tried to get into the side streets the stone throwers drove them back onto the main roads. 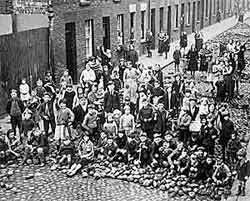 On the Falls Road the mill workers, many in bare feet, came out and smashed up the police cordons trying to prevent the food parcels sent by the unions getting into the beleaguered north and west of the city. The government had finally come up with a strategy. John Campbell, secretary of the Northern Ireland Labour Party, commented "Lord Craigavon's solution was to divide the workers into different religious camps and it was noteworthy that although the recent trouble was spread all over the city only in a Roman Catholic area did the police use their guns". Sir Dawson Bates, Stormont Minister for Home Affairs, claimed the IRA were using the ODR strike as a cover to overthrow "Protestant rights". Nothing like the threat of an IRA uprising to reactivate the sectarian monster. When the rioting stopped two were dead and another fifteen had suffered gunshot wounds - all in Catholic areas and inflicted by the RUC. Nineteen others, nearly all Protestant, had suffered other serious injuries mainly caused by batons. The government was working hard to break the new-found workers unity and had some success in rekindling religious hatred but they also had to compromise. The Belfast Trades Council threatened a general strike (although it is very questionable if its leaders would in fact have carried out this threat). Unionist officials hurried to negotiate with the Trades Council leaders. The strikers won big cash increases in their relief pay. The terms were communicated to the strike committee by a delegation from the trades council. At a mass meeting in St Mary's hall Tommy Geehan proposed the terms be accepted. They were and there was much celebrating around the city. One of the main demands, though, was not conceded, the giving of relief to single persons. Geehan and the other RWG members who were on the strike committee came in for heavy criticism for ending the strike before winning this. It was to have a very bad effect on the unemployed movement. On October 17th left wing Labour Party members set up a breakaway organisation catering only for the single persons who had been left with nothing. And the next month the Trades Council set up a moderate organisation for the unemployed. With three competing organisations, whose leaderships spent most of their time attacking each other, the movement declined and the city grew quieter. The Guardians felt confident enough by December to announce that the new agreed rates were maximum rates only and could be reduced as they decided! The new rates were paid to some, not to others and the single unemployed got nothing at all. However, the most important thing about 1932 is that it was a great episode in the history of our class. For a short time the whole rotten all-class alliance of unionism was cracking. The theory that Protestant and Catholic workers would never unite was exposed as rubbish and the events of the strike provide an inspiration for those of us who see tackling sectarianism as a job that can't be neglected. Let us learn from the mistakes but let us also learn what is possible when workers come together.